Other Products by Gen-Tec. Search other Nitrix Oxide Supplements products. Gen-Tec Citrulline Malate is an amino acid produced from the metabolism of arginine and glutamine. Arginine has been extensively researched and documented for its effects on nitric oxide production and vasodilation but until recently Citrulline Malate has been overlooked. 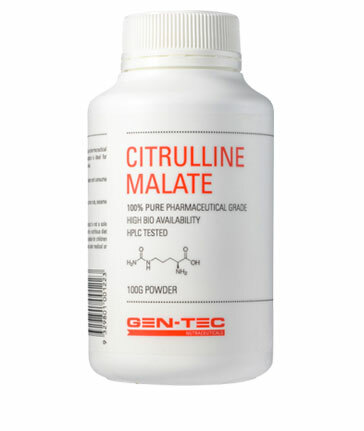 Citulline Malate, unlike arginine is able to by-pass metabolism in the liver resulting in more citrulline malate reaching the kidneys where it can be converted directly into arginine and nitric oxide. This makes Citrulline Malate more effective at increasing arginine levels tna arginine itself leading to greater vasodilation and improved blood flow (circulation). Studies have shown Citrulline Malate to increase musclular endurance, improve muscle soreness and stimulate the release of human growth hormone. Mix 1g (¼ teaspoon) of Citrulline Malate in water and consume 20 minutes prior to exercise. INGREDIENTS: Citrulline Malate, Silicon Dioxide (2%). A delectable low-carb alternative to cakes and biscuits. Great when you need a convenient snack. Tasty and satisfying, half a bar is sometimes plenty.